A spooky apple for a spooky time of year! 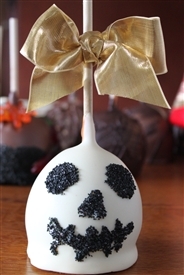 Our Halloween Ghost Apple starts like this: We use a gorgeous DOMESTIC Granny Smith, dipped in buttery caramel, then dunk it in our creamy white (OR milk chocolate if you choose) chocolate- We hand decorate with black colored sanding sugar and wrap in a cello bag, and tie it off with a seasonal ribbon! Our apples weigh 12 ounces to a lb. or more and have an American hardwood stick, just like olden times! Special requests always welcome- call us at 518-372-2243!